Why do some guitar teachers have a lot of success teaching their guitar students to play at very high levels while so many other teachers only create mediocre guitar players? What is it that makes some guitar teachers thrive financially in their business while others struggle year after year? Conventional wisdom might suggest that the secret is in the things that successful guitar teachers “do” that make them different from everyone else. The reality is that while “doing the right things” is obviously part of the answer, it is not “the entire” answer. In my 25+ years of experience both in teaching guitar to thousands of students and training other guitar teachers how to teach guitar effectively, I have spent a lot of time trying to understand the complete story behind this question in order to better help clients of mine to grow their guitar teaching businesses and provide far more value to their students. What I found is that while most guitar teachers“can” become great the primary difference between a successful guitar teacher and an average one exists in their mind – specifically the ability to balance the innate strengths and weaknesses of their personalities and skill sets. Those who have flourishing guitar teaching businesses have mastered the art of channeling their mental powers in this way, while everyone else spends their life fruitlessly trying to learn how to do it (more on this below). In the past, I have written many articles about the specifics of what “to do” as a guitar teacher to make your business more successful (if you missed them, you can catch up by studying this free eBook on how to earn more money as a guitar teacher). In this article I want to introduce you to a very important intangible element, understanding of which can make all the difference between you reaching success (no matter how you measure success) as a guitar teacher or failing to do so. This is part of the training that I take guitar teachers through in the process of coaching them to effectively “use” the guitar teaching strategies they learn from me. As people in general and as guitar teachers in particular, we all have a unique make up of psychological strengths and weaknesses that direct our efforts in everything we do. Likewise, the skills that you develop as a musician (both in your music career and in your general musicianship talents) also lead you to particular areas of expertise. However, the irony of the situation is such that for every skill or strength you possess in a certain area there exists a “contradictory” (and corresponding) weakness that can (and often does) hold you back in some way. Depending on how aware you are of your weak areas, they can take advantage of and override your strengths if left ignored and uncorrected. This happens to guitar teachers all the time regardless of their work ethic or motivation, and worse yet, often occurs without them realizing it. If you are not already a highly successful guitar teacher, then in order to arrive from where you are today to where you want to go, you need to know how to get the most out of the strengths you already possess while minimizing the negative effects of the inherent weaknesses that come along with them. Until you do this, no amount of information about becoming a thriving guitar teacher will help you to actually reach that result. All highly successful guitar teachers understand (even if intuitively) how to do this, and the good news is that anybody (including YOU) can “learn” to do this even if it doesn't come naturally. To illustrate my point, here are a few of the common characteristics I see every day among the guitar teachers I mentor and I will show you how a particular strength can also conceal a critical contradictory weakness. There are actually MANY examples of “weaknesses” that could be included for each “strength” but to avoid making this article too long, I will only list one item in each category. It's important to recognize that the strengths listed in the left column of the table below ARE of course “good” things to have and they DO help you to become a better guitar teacher. However, it is equally important to realize the ways in which these elements can (and often do) ALSO become your weaknesses UNLESS you take action to learn how to prevent them from becoming so. You have excellent guitar playing skills. Many highly advanced guitarists have a hard time RELATING to beginners or early intermediate guitar players (who, by the way, make up the majority of all guitar students). Therefore, guitar teachers in this group often lack skills for teaching effectively a HUGE portion of their potential clients. It’s critical to be able to ‘relate’ to your students who are not advanced, most guitar teachers with excellent musical skills fail in this area. You are passionate about teaching music and helping others. While a strong passion for helping others is definitely a MUST-HAVE for guitar teachers, many musicians in this category completely neglect learning about the “business” side of their endeavor. This prevents them from helping all the people they want to help, since their business isn't financially successful enough to allow them to do so. Fact is, the more money you are earning, the more you can reinvest some of that money back into the value you are able to provide to your students by going above and beyond what other guitar teachers can or will ever do. You are very disciplined in your musical studies and take playing (and learning) guitar very seriously. Guitar teachers in this group often have a hard time relating to students who play music for a hobby. Fact is, the majority of guitar students you will ever have WILL be “hobbyists” and unless you can relate to their musical goals (and frankly, the ‘limitations’ of some of those goals), you will struggle to help them and struggle to keep them in your schedule for long. You play multiple instruments. Most “serious” music students will prefer to study with an expert music teacher in their instrument of choice, rather than a “jack-of-all-trades” type of teacher. Music teachers who market themselves as teachers of many instruments actually hurt themselves by brandishing this credential. You have a lot of professional music career accomplishments. Investing a lot of time in other aspects of your music career most often leaves little or no time to develop the skills needed to be an effective guitar teacher. This is one of the reasons why most (although not all) highly successful professional musicians who teach do NOT have many truly great students to show the world. You are very ambitious and full of ideas about building a successful guitar teaching business. People in this group often have a bad habit of starting many different projects, but leaving all of them unfinished. They often appear to be “working hard” while making very little progress. You are good at thinking things through. Musicians (and people) in this group often fall prey to “analysis paralysis” and have a hard time actually getting started on a course of action. While thinking things through is clearly important, you cannot let this paralyze you into immobility. You are very self-reliant. Self-reliance is an excellent attribute overall, however you need to also know when to ask for help. When it comes to building a successful guitar teaching business, you can avoid a lot of common mistakes by learning from someone who has already traveled the path you are on. You are very persistent and hardworking. Very often “persistence” can go to the extreme of “stubbornness” and prevent you from abandoning a certain path or approach that has proven to be ineffective, both in your business strategies and guitar teaching methods. You are generous and accommodating. Guitar teachers who are too generous to an extreme often hurt their businesses (and their students) greatly when they fail to enforce their lesson policies. You are a very innovative thinker. People in this group often “put the cart before the horse” and attempt to innovate before taking full advantage of conventional means of doing things (that are just as effective and often easier to implement). Innovation is great, if it can be implemented well and other things that do work are not sacrificed or abandoned. Take inventory of your psychological profile of strengths and weaknesses for teaching music and for running a successful guitar teaching business (this guitar teaching test will help you to get started). Create a plan for how you are going to get the most from your strengths while minimizing their negative side effects. This starts with observing and identifying ways in which these “unintentional side effects” of your mind/personality/skills manifest themselves in your approaches to teaching guitar. The illustrations in the table above are examples that should help you to find instances of a particular problem occurring in your own guitar teaching business. Realize that learning how to achieve the perfect balance as described in point 2 above will demand insight, planning and (ongoing) proper training. A big problem is that most guitar teachers (as natural entrepreneurs) are not hard-wired to do a lot of planning and prefer to act on instinct and intuition. They may recognize that planning is necessary, but can’t bring themselves to do it. If this sounds like you, or if you have a difficult time identifying how the “weaknesses of your strengths” hold you back in your music teaching career, then it will benefit you to get help from someone who can show you the most effective way to do this in your guitar teaching business. Commit to refining everything you do to grow your guitar teaching business with the above understandings in mind. That being said, of course you can and should also continue to deepen your knowledge of “what” things to actually “do” to teach guitar successfully. However, you must realize that acquiring new skills will be limited in their ability to help you until and unless you go through the self-assessment process described in this article. 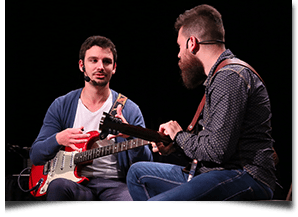 Once you master the ability to mine the most from your existing potential, your progress towards becoming a highly successful guitar teacher will become unstoppable. To get more help with becoming a highly successful guitar teacher, take this free guitar teaching test and study this free eBook on how to earn more money as a guitar teacher. Learn how to teach guitar and develop your guitar teaching business.